Extreme Application Analytics is a Network-Powered Application Analytics and Optimization solution that captures network data and aggregates, analyzes, correlates, and reports on it to enable better decision making and improved business performance. Application Analytics allows IT operations to optimize the network for each and every application, enhance security for those applications and provide data for business analytics. This empowers IT to turn the network into a strategic business asset that can now provide value to other lines of business, and it enables business innovation powered by the network infrastructure. Application Analytics intelligence provides IT with the visibility and control of applications and websites (including related sub-web sites) resident in all parts of the network, from the wired or wireless edge all the way through the core and datacenter, as well as application traffic from the Enterprise to the private Cloud, public Cloud or any service on the internet. 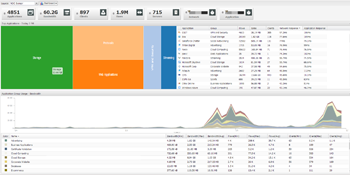 Dashboard – Application and bandwidth usage – Within a specific period of time, Application Analytics easily displays the number of applications, bandwidth usage, number of clients and number of flows. A Massive and Customizable Signature Set – With a library of more than 7,000 applications with over 13,000 fingerprints and growing, and the ability to easily create your own fingerprint. Intelligent Application Visibility – Application Analytics identification uses deep packet inspection (DPI) to provide a rich analytical framework and granular controls for private (SAP, SOA traffic, Exchange, SQL etc.) and public Cloud (Salesforce, Google, Email, YouTube, P2P, Facebook, Twitter, file sharing, etc.) applications essential to your business. This enables IT and other Lines of Business to determine which applications or websites are being accessed, the consumed bandwidth and other statistics on business critical applications versus non-business critical applications. Network and Application Response Time Management – Provides network performance versus applications performance. Proactive Security and Compliance – Provides IT with the ability to monitor and restrict application usage and website access based on specific parameters. For example, a known web browser version that poses security risks could be restricted. 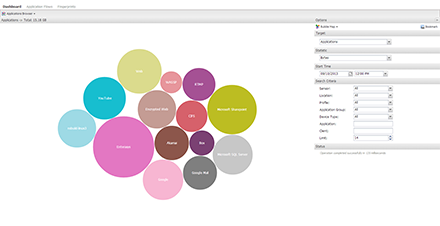 Contextual Information with Depth and Granularity – Associate additional contextual information such as who, what, where, when and how with any application. Application Analytics is the VERY FIRST and ONLY – patent pending – solution that bridges Network/Security Management with comprehensive Business Analytics. Application Analytics allows IT operations to optimize the network for increased application performance while also giving IT the tools necessary to provide detailed network-based business analytics to all parts of the business. This empowers IT to invite and share business analytics information with other Line of Business executives, which will elevate the network and IT functions to a higher and more strategic level for the business. Pervasive intelligence – Application Analytics is built into Extreme™ CoreFlow® switches and is pervasive across the entire network from the datacenter to distribution to the mobile edge. This means there are no network chokepoints or a network overlay required to collect application layer analytics. Massive scalability – Application Analytics works at Tbit speeds and can collect millions of flows per minute without “any” performance impacts to the switch. Better business decisions – Provides context to the application visibility by associating user, role, location, time, device, and more with the application. Better troubleshooting – provide visibility into the application, eliminating issues before they can occur. This increases user satisfaction and the user experience. Complete layer 7 application visibility – Application Analytics uses deep packet inspection (DPI) to provide a rich analytical framework and granular controls for private (SAP, SOA traffic, Exchange, SQL etc) and public cloud (Salesforce, Google, Email, youTube, P2P, file sharing, etc ) applications as well as social media applications like Facebook, Twitter and others. Again this guarantees a better quality user experience for business critical applications. Better network planning – Understand the impact of deployed applications on the network. This provides the data necessary to plan network expansions before user complain. Baseline the application usage on the network – Establish a baseline or matrix on the network usage that IT can use to trend network application usage overtime and identify when abnormalities arise. Reporting for compliance and regulatory – track, collect, and report application usage with built in reporting and additionally export this information to third party reporting products.